Show Just Came Out Today But I Love It Already!!! A great concept that I haven't seen before in anime. As an American, we don't get to see the Japanese side of WWII. All we consider is that they were our enemy at the time. I believe it will be an experience for me to understand more about the situation in Japan at that time. I look forward to seeing what they do with the show. As a student of military and geopolitics in college I was very interested in seeing what this show has to offer. I like the setting (Unique too since Japan usually tends to shy away from talking about this period) in 1937 during the 2nd Sino-Japanese War and the morals the main character faces with working with spies. Downside is that there are almost too many characters introduced in the first episode and the spies at first are pretty much interchangeable. Still, a promising start and I will be continuing it. This anime is adult oriented. It is very similar to Ghost in the Shell in that it is episodic and each episode is about a different person and a different scenario. The cast is the same, but there are so many characters from D-agency that each episode is basically a new character. Only has the spymaster as a recurring character. The back story and overall story telling is pretty good, I just wish it was a bit less episodic. Each episode has a pretty complex plot and you get to see how spy's would get out of each sticky situation. Pretty cool stuff. The characters are all pretty cool. All of them are adults and they are all intelligent. No Shounen characters here, I just wish they were all more recurring. I'd like to get to know a character and then see how he/she reacts in different scenarios rather than get a new character for every episode. Also, the spys all seem to act more or less the same, so I don't really get any unique vibe from any particular one. BUT, this is still way more preferable than a bunch of random trope characters. The action is ok. Not really that much fighting, and it doesn't have amazing battle scenes like other anime. It's more a mind game in each episode. It's definitely more story driven than action driven, and that's ok. Still though, I enjoy a good fight scene every once in a while too. Over all this is a really good anime. When you compare it to the other types of anime that came out this season, it's pretty much the only adult oriented anime that tried to actually be original. You can tell the creators made each episode with a lot of love through the characters, the dialogue, the setting, the plot, the animation quality, etc. It's something you sit down and watch when you are tired of the mindless fanservice and over the top battles that often happen in other anime. I give it 4 stars only because of the fact that it's episodic and I personally would rather have one continuing story that sticks with a few main characters. HOWEVER, their may be future episodes that go back and revisit spys, in which case I'll bump this to 5 stars. It is something new when it comes to the typical 2016 Spring anime. It has twists and it's extremely nail biting. If you like The type of anime that keeps you on the edge of your seat from start to finish then this is your show . Honestly it makes you feel confused if you decide not to pay attention but it is truly worth the watch. Sadly, our main character looks to be a stick-in-the-mud honor-bound noble warrior. The perfect foil for a spy show. He's actually the weakest point in the show - he's too predictable: kill or die with honor. I'd like to see more of the rest of the crew and how they set up situations (and people) to further their ends. The show's name is explained in a poker game that is both a foreshadow and an excellent example of setting up a person. The protag is invited to a poker game. At a spy school. Where everyone is already seated and playing. Of course the game is rigged. Of course the protag loses. And, of course they tell him (so they can infodump on us): this poker game is a facade. This is international politics as a microcosm. Everyone joins in a summit, but most of the decisions have already been made, most of the allegiances already defined. However, not everyone knows who is on what side. The poker game was full of deliberate tells to try to determine the alliances. And, with fresh meat on the table, it was a feeding trough for the non-military members of the spy school. I love suspense spy stories. MI, UNCLE, Kingsman, and JB (either generation) are far too showy to be called 'spy' stories. This has the potential to be a tense and tightly-plotted story, one that is worth remembering because it didn't do the same thing, just louder and with more explsoions. Seeing the wartime Japanese culture. We've seen the propaganda of the Yellow Peril, and we've seen stories about the Imperial Empire in decline (Grave of the Fireflies), but this is Japan at the peak of its power. This was not an easygoing time, and parts (Nanking) were shown to be war crimes. This show looks to cover this era, one that gets shorted a great deal. There are some stereotyped characters. We have the clockwork soldier. We have the gravel-voiced spymaster/headmaster, a sociopath breeding student sociopaths. And the rest of the spy students looks almost interchangeable. All of them are cool, reserved, and taciturn. Their demeanor, which flat, isn't a demerit by itself: after all, this is a spy school, and spies in suspense stories are low-key and not obtrusive. I feel it's a minor nit because there's very little by way of even physical features to differentiate them..
Cliffhanger ending on Ep 1 (which is the only one available at time of this writing.) A needless in media res opening. We show the situation, jump back to the beginning then build toward the situation again. In some cases, doing this give added weight to minor things, but I don't feel this gains it much. It does explain why the officer 'offered' to commit suicide if nothing was found, though. However, I wasn't wondering that at the beginning, so the revelation didn't add to my enjoyment of the scene. Then again, I enjoyed that scene immensely. This show is bold, complex and sensitive. JOKER GAME shows all aspects of a spy's life by piecing together stories of the monsters employed at D-Agency. How to live as a spy, work as a spy, die as a spy...watch its intensely entertaining episodes and find out what makes these men truly great at what they do. Story; a spy network in Japan makes moves around Europe and Chinese Manchuria in preparation for the inevitable entrance into the world stage that is World War II. - The show offers a fresh number of scenes. From Japan, to China, to England, France,and Germany, the stage on which this game takes place is large and diverse. - The drama of the show varies from person to person. Each character's personality is different, meaning some episodes will be more on the comical side while others will be on the drama side. Either way, what you see is a combination of interesting characters who come together for a worthwhile narrative. - The show, while interesting and fun to watch, does seem to be a tad disorganized. While there are 8 main Protagonists in the show, it is very rare for them to work together on missions, usually doing espionage solo. What occurs is that every episode or set of episodes are dedicated to a single spy of the 8. Unfortunately they do not all link up, and some are out of order on the timeline. What occurs is a little confusion on the side of the viewer who pays attention to the minute details. - The Opening is strong, and draws you in almost immediately, but the ending is fairly anti-climactic considering the rest of the series. As with most spy shows or movies, there are some tropes you would expect at the end, and it is up to the viewer to guess which trope is the one for the show. While I commend the show for not falling into the easy way out, I wonder if the alternative was truly any better. After 12 episodes and many missions (most off screen), the military transfer from the beginning decides he is just not cut out to be a spy. He sends his resignation and moves to manchuria on new orders. The spymaster lets him go with no repercussion to the knowledge, albeit a small amount, he knows. No double crossings, no killing the MC, nothing of that magnitude, just a change of career. - While the build up was there for the entrance into World War 2, the war aspect is not explored as much as I wished. Also this show takes place in the 30's, so Pearl Harbor is not a thing. Joker Game in the nutshell; a fun watch to break away from the usual SoL and fantasy-esque animes that plague Crunchyroll currently. Definite recommendation. More like 2 1/2 stars, but I added an extra half star because I'm a fan of Production I.G. and it's nice to have a show that's a little more mature than some of the other offerings this season. The series starts out promising enough, because there hasn't really been an anime that focuses on Japan's spies pre-WWII. I was drawn into the idea of the spy academy, the students, and of the military liaison who was tasked with working with them. As the series went on, however, my interest began to wane. The character I liked the most disappeared from the main story. I know I would've been more invested in the show at large if they had actually taken the time to introduce the characters in more detail. I had a very hard time differentiating the characters, particularly when they were out doing their spy thing. At times I didn't know which character was a member of D-Agency and which were rival spies. I understand that as spies their "real" personalities would be hidden, but the only real introduction the viewer gets to the characters is at a poker game. As such, I still got confused about who was who. I did enjoy the fascinating glimpses into Yuuki's past, and also the complex world of espionage. Little "ah-ha!" moments are sprinkled throughout the series and putting together those details to figure out the overlying mystery in each episode was fun. Overall, the show is watchable, just don't expect detailed character studies of each person or to find out motives for most of them. They're spies. That's all you need to know. I just can't shake the feeling that there's a better series lurking just beneath this one. Maybe a second season would've helped. It might be understandably difficult for a modern audience to enjoy a show that contains as one of its narrative components the militarism of Japan in the years leading up to World War II. There was some concern among early reviewers of Joker Game on other websites that the show would present the mentality of that period so favorably as to be unpalatable, particularly for audiences in nations that fought against the Axis. The protagonists of the show are the leader and members of a new Japanese intelligence agency. Although the leader holds an officer's rank, it is soon clear that the agency is not part of the military establishment. Through episodic adventures, the show's characters use their position as outsiders to critique the ideologies that helped push all the nations of the world into war. That I do not give the show five stars is a matter of taste rather an assessment of quality. I would have preferred more of an overarching story through the twelve episodes than the adventure-of-the-week format we ultimately received. 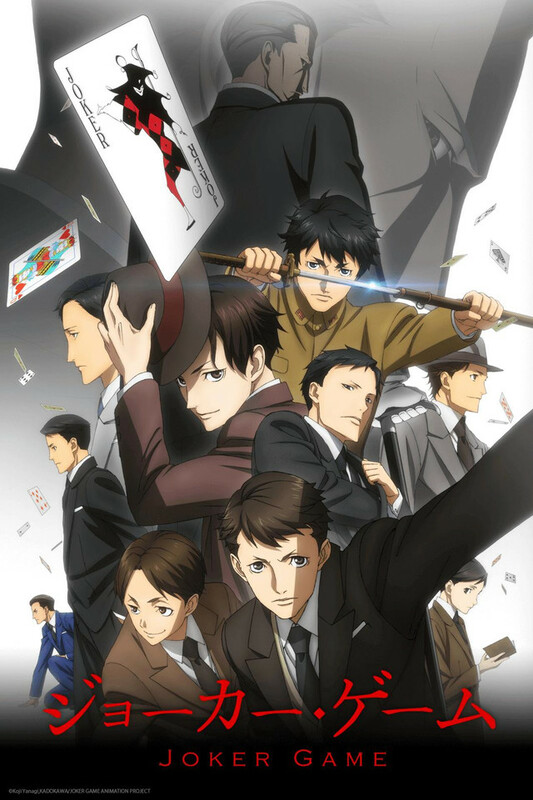 That aside, Joker Game is a fine show and I sincerely recommend it to anyone looking for an intelligent piece of entertainment.